Most of the seed sold in Australia is imported, harvested from plants farmed overseas. This kind of seed can respond differently when grown in different parts of the country. For example, if a seed crop of, say, pumpkin, has been acclimatised to one specific climate zone, such as cool temperate Europe, and a packet is sown in tropical Darwin, dry temperate Perth and subtropical Brisbane, gardeners might get variable results. This is exactly what has just happened to my heritage Italian pumpkin ‘Tonda Padana‘. It’s brilliant in a temperate climate but it cannot cope with a subtropical summer. After a bright start, it’s rotting outside in my Brisbane garden. Australia has a reasonable range of independant seed retailers, despite undercutting by multinationals which drown the market with cheap seed produced abroad, and there’s a increasing range of local Seed Saver groups, called Local Seed Networks (LSN’s). There’s now one hundred LSNs Australia-wide. Unlike seed retailers, community-based LSN’s offer seed of crops that are being ‘localised’ – they are being adapted to suit local soils and conditions. LSNs share their seed stock free amongst members. Generally, the diversity of seed suppliers, and the range of plants they sell as seed, is declining as multinational companies acquire and combine smaller seed and fertiliser companies. The Seed Savers’ Network developed in response to this declining diversity, especially for traditional crops. Business regards gardeners as consumers, and they treat customers as either ‘hunters’ or ‘gatherers’. ‘Hunters’ know what they want and dislike distractions when buying, while ‘gatherers’ regard shopping as recreational. Hunters bring a shopping list and stick to it. Gatherers enjoy browsing. Our buying habits are further mapped out in retail stores. Racks of packaged seed displays are positioned to please both hunter and gatherer. Obvious, well signed displays of common cultivars, from alyssum to zucchini, are strategically placed next to the seed trays, propagating mixes and fertilisers for the hunters. Smaller displays of popular seeds and novelty mixes jostle with the greetings cards and magazines by the till – special deals to tempt the gatherer before they leave. I used to arrange a garden centre in London like this, because this setup is perfect for the novice and it increases sales. Buying seed is a simple over the counter transaction. Stock is fresh, often securely sealed in air- and water-tight packaging, with clearly displayed growing instructions and a ‘use by date’. In these circumstances, buying old, dead, or mouldy seed is unlikely. Check the use by date. Grass seed, whether of species or mixes for lawns, should be sown before expiry because seed of this plant family is vulnerable, not durable. I used to get quite a few returns of semi-dead lawn seed because when it’s packed loose inside cardboard and stored for a long time in different spaces, fluctuations between summer air conditioning and winter heating stresses stored live seed. Use by dates are as important for plants with tiny seed, like lobelia, shiso and poppy. Tiny seed has minuscule energy reserves, and storing them at room temperature can literally wear them out faster than large seed, such as pea or bean seed. Look out for speciality fruit and vegetable shops. Oriental food stores in particular, can be sources of unusual and interesting plants. African food stores in Brisbane are where I buy raw peanuts in the shells – viable, economical seed. Health food stores are economical sources of bulk seed for green manures and vegetables, like sunflower, peanut, various peas and grains. If you’re growing seed to produce sprouts, only use certified organic seed because it is chemical-free. Health food stores are the most thrifty source of organic seed for sprouting or mass sowing. These stores are also where I buy the pods of true cardamom (Elettaria cardamomum). This is often the only way you can grow the genuine species because so many nurseries sell misidentified, mislabelled false cardamom (Alpinia nutans), claiming it is the real thing. Mail order seed catalogues greatly expand choice, and some provide useful growing tips. Gatherers can compare prices and quantities offered. Over time you’ll discover who’s seed produces the best quality plants and who’s seed is less likely to germinate well. Discovering what’s new in each successive catalogue is great fun in itself. There’s a popular belief that seed is a safe way of moving plants between countries, because there’s a lower risk of seed carrying pests and diseases. This belief is misplaced. It only applies where seed is ‘clean’, and that requires professional handling, cleaning and sorting. Amateurs tempted to bring plant souvenirs back from overseas holidays risk the health of entire industries, as well as stiff fines and possible imprisonment. Internet shopping tempts inadvertent, illegal seed importation. Reputable companies will not supply to Australia – they know of our strict quarantine laws. Australia also has interstate quarantine, designed to limit the spread of pests, diseases and potential weeds. The best suppliers indicate which plants cannot be sold to WA or Tasmanian gardeners. Expect to pay a premium for ‘new release’ cultivars – you’re covering the cost of promotional advertising and plant breeder rights. Expect premium prices for unusual or rare plants too. You’ll probably also get fewer seeds than usual. There’s also a possibility that, because of limited demand, rare plant seed may have been stored for lengthy periods and their viability reduced. Hybrid seed is costly because of the production involved. An ‘F1 hybrid’ is seed produced by the first, controlled cross pollination of two parent varieties, so their hybrid offspring combines the best qualities of both parents. ‘F2 hybrid’ seed is a result of saving seed produced by the F1 generation. 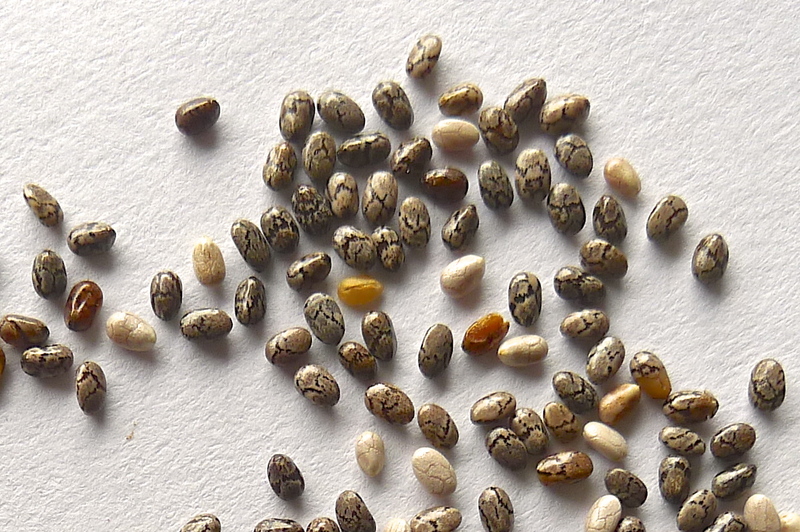 Bedding geranium seed (Pelargonium x hortorum) is one example where F1 and F2 hybrid seed is sold, but many hybrids, like F1 sweetcorn, don’t produce seed worth saving or selling. There are several small, keen seed subcultures on the rise. More Australian plants than ever before are available as seed, often in bulk for mass plantings. The variety of paper daisies available is one example of how the native seed industry has expanded its range. Legal harvesting of wild Australian plant seed supports revegetation networks who are combatting dryland salinity, soil erosion and restoring wild communities to health. Heritage plants support a growing subculture. Some gardeners are abandoning hybrids for ‘old-fashioned’, ‘traditional’, ‘heritage’ or ‘open pollinated’ plants. These are generally easier to grow, their seed is easy to save at home, and saving seed connects the gardener to annual growing cycles. Lacking the uniformity of hybrids, and generally no less productive, open pollinated plants tend to be more robust and need less food and pesticides to produce something worthwhile. Fertiliser and pesticides are a hidden cost, and a common consequence of growing modern hybrids for farmers. Membership-based ‘Seed Saver’ networks make additional efforts far beyond offering unusual seed: they offer education, planning, advice and events, as well as free seed to Local Seed Network members. Seed Savers deliberately adapt their cultivars to suit local conditions and soils. With our enormously varied climates and soils, locally adapted Australian-grown seed can offer practical advantages over foreign seed grown in just the one climate. Most important of all, as our climate changes, gardeners and farmers who practice seed saving techniques are able to improve their crops. Seed Saving supports local food security in a warming world. The only source of Mouse Melon seed (Melotheria scabra) that I know of is from Shaman Australis. Ask Mr Weidermann nicely! Fancy growing the biggest mangelwurzel in the southern hemisphere? Or possibly nettles? Contact Michael Self at Phoenix Seeds, Tasmania. I always grow decorative, edible Amaranthus, aka amaranth, including Joseph’s Coat (Amaranthus tricolor) and other traditional edibles like A. cruentus, A. gangeticus and Love-lies-bleeding, (A. caudatus which comes in red-flowered and green-flowered cultivars). Seed is available from Royston Petrie, Green Harvest and Eden Seeds, and also from Australian sellers on Ebay. If you’re after Cocoyams (Xanthosoma saggitifolia), or Aerial Potato (Dioscorea bulbifera) or Winged Yam (D. alata) I share my surplus at my Open Days. They are a visitor perk. Cocoyams are sometimes sold in far north Queensland fruit shops in autumn, and may be labelled ‘White taro’, a redundant common name. While I have been told there is one commercial grower left in Australia – somewhere around Innisfail/ Tully – I do not have their contact details. Seeking landcress, Barbarea vulgaris or upland cress, Barbarea verna? Try Greenpatch or Southern Harvest. Good write up Jerry, thank you. I have been putting together a list of Australian (and a couple of reputable overseas) seed suppliers etc for some time. I found a couple on your list that I didn’t have. I used to regularly import seed and export flora. I have been scouring the sites for seeds for the “Huauzantle Chenopodium Berlandieri” Spinach. But unable to find any. Watering daily in windy old Wynnum. “there’s a increasing range of local Seed Saver groups, called Local Seed Networks (LSN’s). There’s over fifty Australia-wide. ” Great, but where are they? is there a list somewhere? because the Seed Saver Network does not publish one, or if they do it is extremely hard to find. Unless you visit the Seed Savers website, you’ll never know. Including me BYRON HINTERLAND SEED SAVERS See our Face book page. How long ago was that? Have the rules changed much since then? It would be great to have correct simplified guidelines about what vegetable seeds can be imported, in what conditions etc. I have heard all sorts of horrifying stories. I seed packet accepted because the botanical name is mentioned, a similar packet with similar photos, descriptions and common names confiscated because no botanical name is visible on the packet. I have tried to inquire about permits, was given the run around and eventually told that it would cost me $100 plus per permit per seed packet. Packets of items often bound to appear on the market 1, 2 or 3 years later for $2.00 to $5.00, well the modern hybrids anyway, may be not the heirlooms. Why why ? this looks more like bureaucracy gone mad rather than sensible border protection. What do you think? Where did you get your Manning Pride maize seeds from? Bega Valley Local Seed Savers Network. Seed is available to members only. Please ask a local gardening expert, it is illegal to transport plant material from interstate into WA without a phytosanitory certificate. Where can I get seed from ‘first fleet’ lettuce? I have asked seed saver groups with no luck. Hello Jerry, I would like to know where I can get geranium seeds. I want to take them back to the Philippines where I spend most of the year. I hope you can help me. Regards Bob Smith. Quarantine exists to prevent the international transfer of pests, diseases and weeds across borders. It is illegal to take seed into the Philippines without an import permit and a phytosanitary certificate issued by the country of origin. Is it possible to grow somehow Cocoyams in Tasmania? I understood it’s a tropical plant and needs frost free conditions so I’d imagine it’s not possible. However, if there’s a way, is it even possible to get their rhizomes down here in Tasmania? Also I’d imagine not because of all quarantine restrictions. I ask because I used to love the taste of the cooked leaves back in Brazil where I’m from so I’d be so happy to have a chance to grow them myself but my current location might stop my attempt, unfortunately. Thank you! If you have a heated glasshouse in winter, then yes.